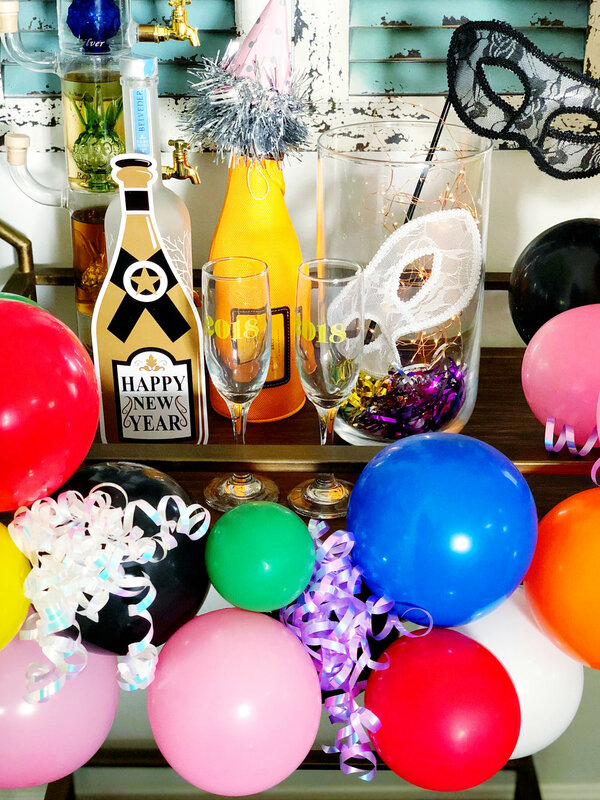 This year I decided to spruce up my bar cart for our New Year's celebrations! 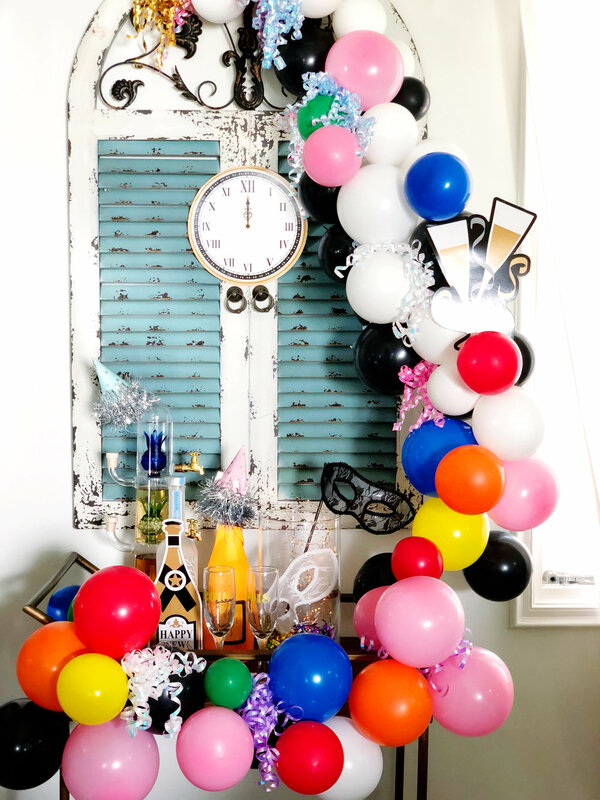 I've been swooning over the amazing balloon creations by artist Jihan Zencirli (Instagram handle @GERONIMO) and was inspired to create my own ballon art in the form of a garland for my bar cart! 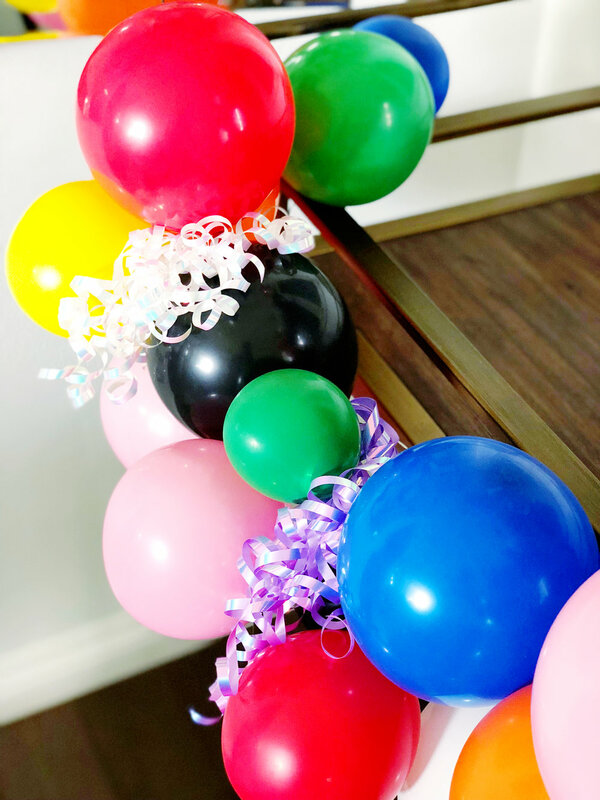 This DIY tutorial can be utilized for not only New Years but all kinds of parties and celebrations! From kids birthdays to graduations, just adjust the colors to fit your theme. *I purchased all my supplies from the 99 cents store, I love a good bargain! To start you will need to use wire to create the placement of the garland. I have a permanent fixture above my bar cart so I decided to attach the wire onto it, then cascade the wire down and around the side of the cart, giving the cart a wrapped look. Next I started to attach the black and white balloons to the wire with tape, in a scattered pattern. 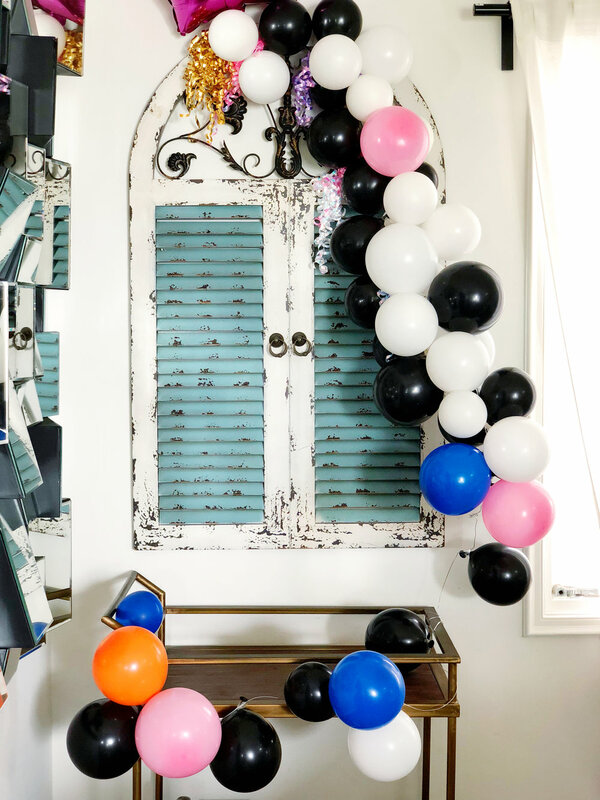 I chose to make the base of the garland with the black and white balloons. I added them from the top of the wire all the way to the bottom, leaving more and more space between the balloons as I got closer to the end of the wire. I also used double sided tape to keep the shape of the garland in place (pictured below). Once I was done with the base (black and white balloons) I started to incorporate the colored balloons. I scattered them around filling in all the gaps that I had left. I had no plan when it came to the placement of the colors, I just added them in one at a time and organically went forward with what combo felt good. Get creative with your placement, you really can't go wrong! The next step after I had added the colored balloons to the garland was to add in the curly ribbons. I placed them around the garland, from the top to the bottom. I left space between them so they were equally placed around the garland. These ribbons came with sticker attachments so it was supper easy to attach them to the garland (if yours do not have the sticker you can use double sided tape). Next I incorporated classic New Years decor icons onto the garland and shutters that were also bar appropriate! I also added a "Happy New Year" Bottle of champs that I stuck onto a bottle of vodka with double sided tape! The last thing to do is fill up your cart with all your favorite New Years items like noise makers, mini celebration hats and fun masks! Then load the bar up with the usual suspects; champs, tequila, vodka etc. and some themed appropriate stem wear. I got these great "2018" Champaign flutes from the 99 cents store, serious score! Once you're stocked up, pour yourself a glass and enjoy the celebrations!